This versatile, compact and powerful machine is all you need to take you to the outdoors. Designed originally for ski patrol use, the SKIZEE is rugged and safe. A new invention by 2 skiers working in Kimberley, BC. The size is about 40" long and the chain is 11" to 13" wide. the skizee needs about 2' clearance for trail skiing. The total weight is around 100 pounds, easy to lift into a car, or out of deep snow. it has a gas tank that holds 4 l regular gas, it can travel over 30 km with this gas tank. 10 hp 4 stroke engine. Speed is 15 - 25 km/hr depending on terrain. It has a 12V battery for electric start, and a power outlet in the handle for plugging in any charger or headlamp. The skizee is great for fast access to skiing terrain, that requires a long tedious ski along a logging road. 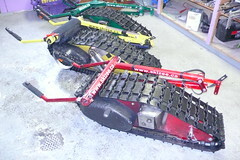 It is also useful as a trail breaker and trailpacker for xc skiing. And of course it is great fun to use on skis, especially in areas where there are no big ski hills nearby.